Are Fan Edits & Fan Content Really Coming To An End As Manual Hands Take Over Content In Groups? Are Fan Edits Really Coming To An End?, Is The System That Strapped For Cash They Would Rather Ban In The Hopes Of Sales? Over the years youtubes been fraught with claims, strikes, inconsistencies and legal battles all over the world and after some dealings it now seams that companies are also hiring staff to "Manually Search" youtube for content. A lot of editors would manipulate footage, reduce scenes, alter aspect ratio and FPS to get past googles content ID system, but in todays day and age companies really are paying people to go and look for content. So how ever much you alter it, the moment you throw it out there, be it with a bogus "Video Title" then post it in the fan base its about.. someones right onto it. These people are on your blogs, your forums, your facebook pages and groups, places you set up for Fans. Its always been bad that the scum cash sucking creeps hang out trying to scam fans of things with bogus merchandise and over priced collectables, but now we have to deal with companies invading communities to find links to stuff they can either earn off or BAN? The one that gets me the most is Universal Studios (they tend to hide behind NBC, CBS CID and another number of Network and Publishing rights) they are happy to leave your video on line as long as they are the only one earning off it. 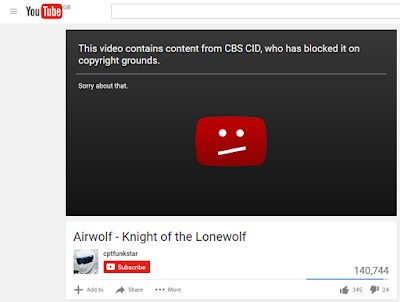 IE if the video has 2 claims, they block it. Not only that but you get a strike on your account until you remove it. Another tactic now (to get more ownership) is to claim your using Content from a DVD and Also the Bluray.. so you get two claims for the exact same content. 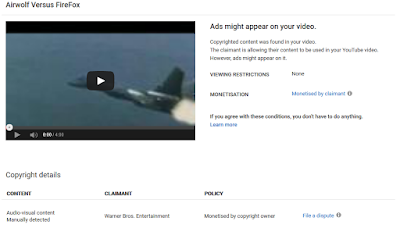 You can see here that also the Immediate Music claim and the Globus claim (are kinda Valid) but clearly the music either belongs to immediate music OR globus (as a company rights holder) The video doesn't contain Both works.. one has words, one does not..
Each publishing company (sub division.. 3rd party, them Initials) its like getting multiple claims off Fox, 20th Century Fox, Fox Network, Fox Channel for 1 single thing.. are none of them even working together? In turn with the amount of fingers in that Pie the video is yet still available World Wide, but will Not play on some devices. maybe those with an ad blocker or even as cheeky as those with location services switched off.. who knows? That said do they have a right to know the audience their content is reaching?.. wont that lead them to the private groups that share stuff they make? Are creative fans really supposed to now hide? you can't hide, even when ya nice you'll still get trolls.. it all makes it simply not worth the effort at all to do any fan kinda content. The reality is that the creators are doing more these days than the original thing often ever was, why don't they get on board with the fans who bring them business.. i have no idea. I remember when the net had images bigger clearer than the current fuzzy postage stamp sizes, when people had fan sites and the world as a whole was creative.. These days its all memes asking you for personal info to the stage of phishing right on a news feed, then theirs them videos with a playbutton that don't play.. yet open a page with a YT video..... why do people not just share the video? Obtaining a License to Distribute your version has always been complicated, and involved a label or a manager and many many legal fees and time. A costly and very complicated prospect for many.. BUT now made simple via LOUDR. Now i still recommend Distrokid (for your own works, because that covers google, iTunes, amazon and spotify, and more of a percentage of your sales) BUT with Loudr you can sell Cover Versions via loudr and still get it on iTunes while loudr take care of the legal side for a percentage (iTunes also take a cut, but then your not paying to keep it on their, so its money for nothing in reality) and ber in mind the Original License holder of the (c) will also get a percentage. Its recommended to work alone (on a cover) less of a split with the royalties..
Loudr can split the royalties between who YOU want..
You upload the image and the audio file. You list who is performing on the track "you uploaded"
The % Aspect Is The Only Way To Really Keep Your Music In Stores When Your Gone..
Distrokid now also offer to deal with cover versions but their is a monthly fee to be paid 12 months in advance. But if your releasing through a specific lable or something then that maybe the way to go. If you have issues finding the Loudr JOIN page try this link.